The tower is the third-tallest building in the Denver skyline. The tower resembles the cash register shape of the atrium across the street. A sky bridge spans Lincoln Street. The new LED columns are six times the resolution of normal high-definition displays. In 2012, Boston-based Beacon Capital Partners acquired the Wells Fargo Center. With its 698-foot reach and unmistakable shape, Denver's "Cash Register Building" -- lining the 1700 block between Lincoln and Sherman streets -- is the city's third tallest structure, and arguably its most iconic, with a 52-story tower resembling an antique cash register, a sky bridge spanning Lincoln and its own unique zip code, 80274. Rumor has it that world-renowned architect Philip Johnson -- the mastermind behind The Glass House in Connecticut and Sony Tower in Manhattan -- designed our Cash Register Building for a plot in Houston, Texas. Denver-based architectural historian Amy Zimmer had even heard that somebody once mentioned to Johnson that his oddly shaped tower had serious design flaws, because ice was falling off the building, to which Johnson responded, "Do they have ice in Texas?" (This unintended consequence of the design was soon solved by installing heating elements, although the sidewalk still closes after big snowstorms). 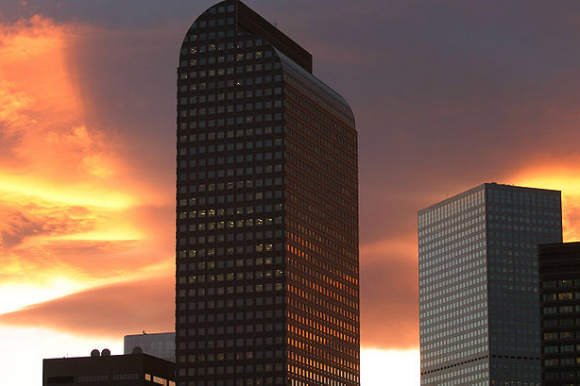 According to local architect Alan Golin Gass, "United Bank of Denver commissioned Philip Johnson to create a new tower, bridge and atrium addition to William Zeckendorf and I.M. Pei's exceptional Mile High Center complex." The Mile High Center -- known today as the Wells Fargo Center -- had been completed in 1956 with the city's first modern skyscraper, and some thought Johnson's additions were too much for the site. The shape of Johnson's atrium resembles the double crescent that crowns the tower across the street. "The cash register shape was used because it was built for a bank," says Zimmer. "Postmodern design borrows elements from the past, but does strange things with them." Here, the oddity would be putting a mimetic spin on a skyscraper otherwise built in the international tradition. Banks have always anchored this center: United Bank first, followed by Norwest Corporation, which merged with Wells Fargo in 1998. Today, the Wells Fargo Center and its Cash Register Building host 30-plus tenants, including financial service firms, energy companies, law firms and other professional service firms. Over the years, the Cash Register Building has "become the symbol of Denver," as Zimmer puts it. "Even our city logo has the building on it." A cutting-edge update The tower is the third-tallest building in the Denver skyline. In March 2012, Boston-based Beacon Capital Partners purchased the 1.2-million-square-foot Wells Fargo Center for $387.5 million, according to city records. The real estate investment firm recently unveiled a $17 million makeover that includes a fitness center, courtyard, upgraded lobby and a significant permanent art collection. The property is one of three that Beacon Capital owns in Denver. "Beacon invests in office buildings in cities that have a highly educated, skilled workforce," says Senior Vice President Cathy Mossman. "In particular, we like Denver because of its ability to attract young, educated workers, and the companies that want to hire those workers." The site had last been updated in 2001. "The building was in great condition, but Beacon felt it was time for a refresh, to bring it up to the standards of other properties in its portfolio," explains Denver-based Gina Guarascio, vice president for Callahan Management, Beacon's property manager for the Wells Fargo Center. "Because it is such an iconic property, we wanted to reinvigorate it and restore it to its place of prominence in the downtown Denver market," Mossman adds. Beacon Capital wanted to honor the site's original architecture; to that end, art and interior design played a major role in a yearlong overhaul. Created by New York-based ESI Design, the centerpiece of the renovation is a massive digital media program. Head into the Cash Register Building through the Lincoln Street entrance; ESI's contribution comes into view as you glide up the escalators in the glass-enclosed atrium. Near the sky bridge, you'll see a set of five floor-to-ceiling LED columns that are six times the resolution of normal high-definition displays. In one of Denver's bigger pieces of public art, monolithic screens display a dynamic series of digital artwork -- waterfalls, for example, with spray that blows based on the city's current wind patterns. The imagery rotates in five-minute increments, reflecting the regional landscape. Viewers might walk up to a grove of trees, modeled, textured and animated individually in 3D with leaves calibrated to change with real-time seasons. Or maybe you'll spy a flock of algorithmically generated birds -- 3,600 of them! -- soaring in authentic flight patterns. Mimicking the digital leaves, the male birds change color seasonally just like Colorado's state bird, the lark bunting. Hang around until the Instagram landscape pops up. This mosaic of Colorado vistas contains thousands of Instagram photos snapped by local photographers, all configured into a landscape formation. From afar, you might think you're looking through slats in an enormous fence, out onto the foothills. That was the intention, anyway, according to Ed Purver, Senior Designer at ESI Design. "We saw a huge wall, an amazing blank canvas with a really impressive scale," says Purver. He and his team wanted to "create an intervention that matched the scale of the wall and the building, but still felt elegant." "We didn't want an enormous rectangular screen that would have felt like digital signage," Purver continues. "So we split the screen into five separate columns of LED to accentuate the impressive verticality of the atrium. Viewed together, they create one canvas." Artful additions In 2012, Boston-based Beacon Capital Partners acquired the Wells Fargo Center. Beacon Capital was looking for artwork that would engage its tenants and visitors, and it capitalized on long lobby walls by installing a gallery, essentially, featuring oil-on-canvas paintings and sculptures by New York-based artist Enoc Perez, whose work has been displayed at New York's Metropolitan Museum of Art and the San Francisco Museum of Modern Art. "The commission consists of a sequence of 14 large-scale paintings for the lobby's niches, and a complementary series of five unique sculptures for the elevator alcoves," says art consultant Anne Strauss, who worked on the commission. "We were looking for artists whose work would offer direct connections with the Wells Fargo Center architecture," continues Strauss. She found that in Perez, who is known for his architectural style. Perez's paintings were based on reproductions and photographs of the structure they reside in. Each is an abstract take on the building's unique shape "rendered in a broad palette, ranging from subdued tones to dazzling vibrant colors," says Strauss. Beyond telling the story of the Cash Register Building, the paintings "pay homage to Frank Stella, one of Philip Johnson's contemporaries," says Guarascio, noting that Perez was inspired by Stella's pencil sketches. Like his paintings, Perez's chrome-finished wood sculptures were inspired by the surrounding architecture, mimicking the finishes that the architect used. "The works animate the lobby, and offer a unique pairing of art and architecture," Strauss says. ESI Design also redesigned the lobby as part of the capital improvement campaign. was brought in again, and charged with modernizing the space while making it more comfortable and conducive for social interaction. "While the exterior of the building is well known, the interior had underutilized yet grand spaces," says Chris Niederer, senior designer at ESI. "Tackling such spaces while not clashing with Philip Johnson's postmodern aesthetic was challenging." Local partners in the remodel included Venture Architecture and Yesco Denver; Jordy Construction acted as general contractor for the project, which kicked off in the fall of 2014, and was completed last May. "The transformation of the Wells Fargo Center is outstanding, and we are very happy with the result," says Mossman. She's heard positive feedback from local business and Denver's arts community, too. As Guarascio puts it, "Beacon approached the project in a sensitive, creative and contemporary way." Guarascio says the combination of digital and traditional art "created something very special that is unlike anything else in Denver today. Our tenants," she adds, "appreciate the beauty of the space. We also have visitors coming to the building just to see the art."